Mayan Pyramid Fires Energy Beam Into the Sky or iPhone Sensor Glitch? YOU PICK! 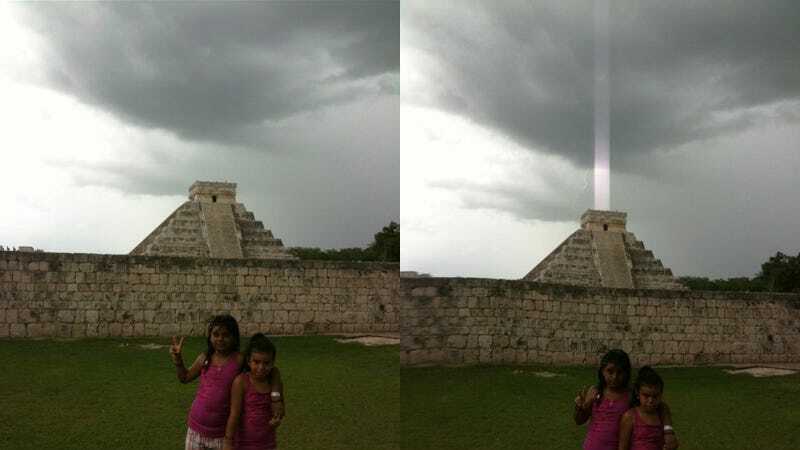 As if it wasn't enough with imbeciles claiming that the Earth will be consumed by a supernova or a hungry black hole in 2012, now we are getting photos of Mayan pyramids firing energy beams into the sky. Great. Just great. Those are the words of Arizona State University's Mars Space Flight Facility researcher Jonathon Hill. He makes perfect sense, as you would expect from a scientist who works for NASA. The three images Hill is referring to were taken by Hector Siliezar while visiting Chichen Itza in 2009. Chichen Itza is a large city built by the Mayans around 600–900 AD, located in the Mexican state of Yucatán. The Mayans were these people who, according to many experts in tinfoil hats, were amazingly prescient. So prescient that they made a calendar announcing the destruction of Earth in 2012 but failed to see a handful of Spaniards conquering them a few hundred years in the future. In reality, the Mayans were just a Mesoamerican civilization who were pretty good at art, architecture, astronomy and mathematics. Their civilization started on 2000 BC and lasted till Spain beat the crap out of them in the 16th Century. Hector's camera EXIF data reveals that the photo with the beam was taken on July 24, 2009 at 2:00:31PM. His iPhone captured the image at 3.85mm focal length, F/2.8 and with a exposure time of 1/436 seconds. Hector told Earthfiles—a site who claims to have thousands of "real X-files"—that nobody saw the "beam" of light when he took the photos. He could only see it in the image that captured the lightning, corroborating Hill's technical sensor glitch explanation.